MNC was pleased to be a part of this wonderful biannual event held in Manchester. It is a conference for people with multiple sclerosis and is the largest event of its kind in Europe. 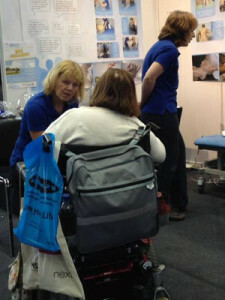 This year it was held at Manchester Conference centre and was a very busy weekend. There was a huge variety of stands showing everything from self care aids, mobility and diet to demonstrations of mobility dogs and many classes in yoga. There were also a number of excellent speakers presenting on many aspects of medical care etc and these are still available to view on Youtube. MNC had a role particularly in showing the role of neurophysiotherapy. Our main message was that ‘hands on therapy makes a difference’. We gave mini assessments and treatments to many people to show the positive effect of hands on therapy and we also met many people who have had MS for several years who had not yet been seen by a physiotherapist at all. We found this amazing in this day and age where the research is so clear on the benefits of therapy and exercise for this condition. All in all it was a great weekend, hard work but very rewarding and we expect to be there next time.